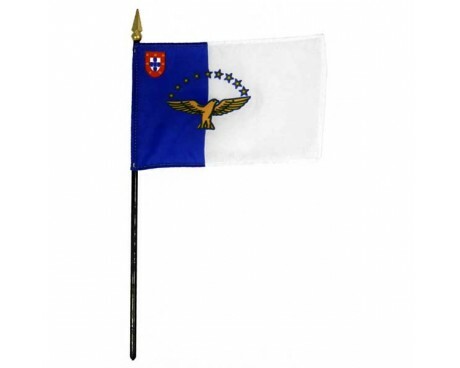 Azores Stick Flag - 4x6"
The nation of Portugal dates back to the medieval period, and its oldest flag comes from the same time. 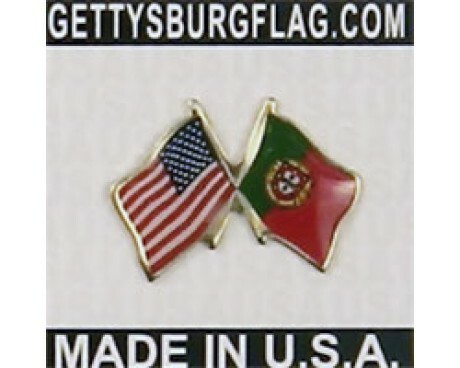 The flag of Portugal has changed a great deal since then and the modern flag was specifically designed to break away from the symbols of the nation's old monarchy, but it still preserves a few subtle links to the past. The flag of Portugal (Portuguese: Bandeira de Portugal) is a rectangle-shaped bicolor with a field vertically divided into green on the hoist, and red on the fly. The lesser version of the national coat of arms (i.e. armillary sphere and Portuguese shield) is centered over the color boundary at equal distance from the upper and lower edges. Portugal officially adopted this design for its national flag on June 30, 1911—replacing the one used under the constitutional monarchy—after being selected, among numerous proposals, by a special commission whose members included Columbano Bordalo Pinheiro, João Chagas and Abel Botelho. Area of Portugal: 91,951 sq. km. 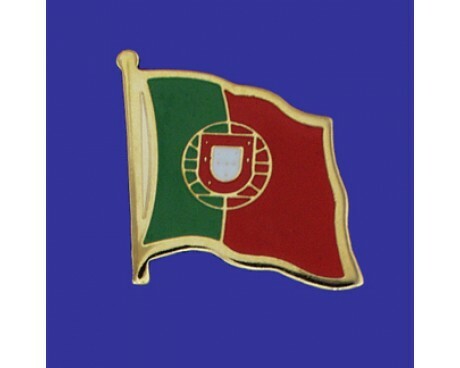 The current Portugal flag consists of two uneven fields of green and red with the lesser Portuguese coat of arms centered on the division between the two fields. 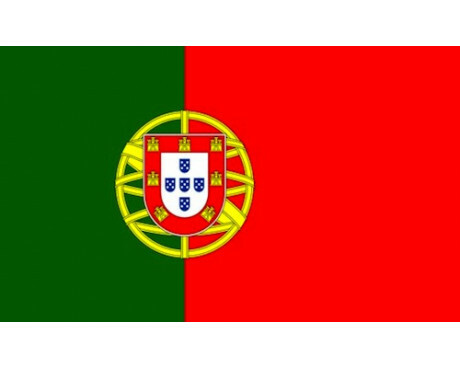 The colors had been used as symbols of the republican movement against the Portuguese monarchy for many years before the flag was adopted, so they represented the nation's transition away from the monarchy. The red section also represents the blood shed by the nation's defenders, while the green section also represents hope for the future. The coat of arms represents the nation of Portugal as a whole, and it also serves as a subtle reminder of the country's medieval past. 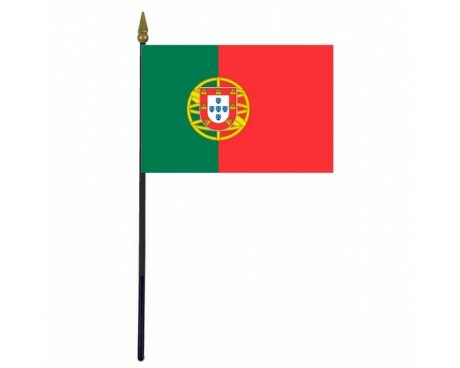 The earliest flag of Portugal was the personal banner of its count. The earliest record of the banner describes it as a blue cross on a white field that was carried by the count into his battles against the Moors. The first count's son adopted the same banner when he took power, but he added five sets of silver bezants to the cross as a symbol of his power when he declared himself to be the first king of Portugal. The blue cross remained the primary symbol of Portugal until King Alonso III took power in 1248. He was not the previous king's oldest son, so he did not inherit the unchanged coat of arms when he took the throne. He merged it with the Castillan coat of arms to create his own emblem, which was a cross made of five blue shields on a white field surrounded by a red border. That coat of arms would represent Portugal with only small changes until the modern era. The coat of arms was used on a white field until the reign of Maria II in 1830. Her flag featured the coat of arms on a split field of blue and white, and it was used as the Portugal flag until the end of the monarchy. The modern flag was adopted soon after as the symbol of the Portuguese republic.